The Solar LED Association in Japan announced in February 2014 that it has started selling a new type of small, solar-powered water purification system that can produce potable water from rainwater, river water, well water, and even household bathwater, without the need for external power. This would make it especially useful in times of disaster. 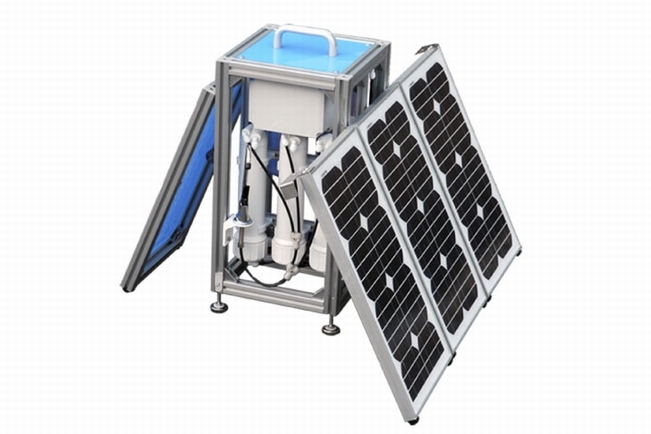 Three different-sized models are available -- Solar Swan, Solar One, and Solar One-mini -- each designed in compact form, equipped with folding-type solar panels, and weighing between 20 to 35 kilograms. The smallest model, Solar One-mini, measures 30 centimeters, and is designed especially for residential use. The key to the system's high-quality purification capabilities is its two-step impurity removal procedure. In the first step, relatively large-sized substances such as sand, mud, pollen, iron, and manganese are removed by a pre-treatment filter. In the second step, viruses and bacteria, such as colon bacillus, are removed by activated carbon and a reverse-osmosis membrane. The system has a purification capacity of 0.6 to 1.0 liters per minute and can provide about 300 to 400 liters of safe, potable water per day. The association intends to promote use of the new system in local municipalities around the country as its initial target market, and then on isolated islands and in developing countries that lag behind in water infrastructure development.